UNESCO (United Nations Educational, Scientific, and Cultural Organization) was an early sponsor of Santa Fe and its International Folk Art program and provided funding for ten artists, followed by an artist-training program involving 22 countries. UNESCO continues its support of the event and its initiative to train cultural entrepreneurs. Clearly, this is more than just a place to sell one's wares. As Irina Bokova, Director General of UNESCO, has said, "Culture is what makes us who we are. It gives us strength; it is a wellspring of innovation and creativity; and it provides answers to many of the challenges we face today." While many folk artists earn meager fees for their efforts in their communities, in Santa Fe they collectively sold their work for over $2.7 million last year and shared marketing practices with their fellow artists with similar goals and ambitions. The International Folk Art Market, founded simply as an idea to recognize an art form that epitomizes the cultures and identities of people around the world and provide a critical mass for the sale of the artists' work, has greatly expanded over the last few years. The Market today provides services and training to "to meet the specific challenges that folk artists are facing in the global marketplace." And instead of meeting just once a year, the International Folk Art Alliance (IFAA), as the organization is now known, is working with folk artists all year long to address their concerns, help them with marketing issues or support their local communities. Moreover, the Alliance pours much of what it earns back into efforts to help these communities around the world fund folk art projects, provide clean drinking water, and even improve health care. Through the newly organized Alliance they also hope to provide approximately $1.5 million in direct financial support for new artists to attend the Market and to offer business development training and support for 1,760 artists. By 2018, IFAA estimates that total revenue will exceed $32 million, and will have involved 950 artists from over 100 countries. This year the festival will showcase how artists are building community in Ecuador, bringing holistic development to rural India, educating children in Pakistan, empowering women in Afghanistan, bridging the gap to the world in Madagascar, and feeding villages in Niger. Artists from Nepal, Cuba, Mexico, Kenya, Haiti, Indonesia and elsewhere will all be showing their work. Next month Santa Fe (July 11-13) hosts the 11th International Folk Art Alliance. As CBS News broadcast last year, "The New Mexico landscape is art in and of itself. It's also a place where artisans from around the world come to sell their wares and transform their communities back home." The complete history and marvel of the International Folk Art Market's ascendancy as a premier event and the role of its founding organization is documented in a new book, The Work of Art: Folk Artists in the 21st Century, by author Carmella Padilla. "Distinct cultures represent unique visions of life itself, morally inspired and inherently right. And those different voices become part of the overall repertoire of humanity for coping with challenges confronting us in the future. As we drift toward a blandly amorphous, generic world, as culture disappears and life becomes more uniform, we as a people and a species, and Earth itself will be deeply impoverished." IFAA's mission ensures that Parsall's "repertoire of humanity" is kept alive and the distinct cultures embodied in folk art are celebrated. It's been an amazing journey for folk art, artists and for Santa Fe. Few cities could do what this art and culture mecca has developed: a truly international festival and growing market for folk artists from around the world and a way to keep these arts and traditions alive and vibrant. "FOLK ART is the art of the everyday... rooted in traditions that come from community and culture...(expressing) cultural identity by conveying shared community values and aesthetics." 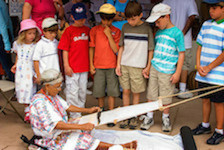 Almost a decade ago, businesswoman Judith Espinar, Tom Aageson, then executive director of the Museum of New Mexico Foundation, Charlene Cerny, formerly director of the Museum of International Folk Art in Santa Fe and Charmay Allred, a community philanthropist, created the market idea with 60 artists participating the first year. The annual event grew almost every year thereafter and now attracts 125 artists from over 60 countries and 25,000 visitors. "Our responsibility is to listen to the artists, and what they are telling us is that they need more opportunities to sell their work. So we are aggressively pursuing additional Markets. We are also expanding our artist development and training programs. This year we added two new opportunities for artists- the IFAM | Online which will launch in the fall, as well as a market at San Diego's Museum of Man. The San Diego market will complement the Empowering Women Exhibit, a touring show curated by the Museum of International Folk Art." Children attending the festival can participate in the Market's "Passport Project" which allows them to "interact with the all the artists, learn about the artist's country and receive that country's flag sticker for their "passports". Once they have "explored the world", they earn a colorful badge celebrating their travels." This not only gives young people the opportunity to learn about each country's culture but also helps them to better understand the "World Community". Santa Fe is one of our nation's premier arts towns with 38% of its revenues coming from creative industries and more than $1 billion in revenues each year supporting more than 17% of all jobs in Santa Fe County. According to the Americans for the Arts and the National Endowment for the Arts, Santa Fe has the highest per capita number of fine artists, architects, writers and authors and arts-related businesses of any city in America. It also has the second highest concentration of total artists in its labor force. Richard Florida and Kevin Stolarick, a colleague at the Martin Prosperity Institute, using data gathered by the U.S. Census Bureau found that Santa Fe outpaced San Francisco, New York, Los Angeles as the city with more "artists and related workers" per capita than any other city in the nation. 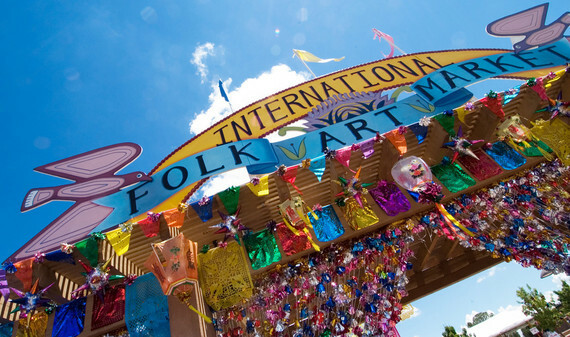 With the continuing expansion of the International Folk Art Market and the efforts of IFAA to develop opportunities for the artists, Santa Fe is clearly a special place for creatives, for promoting the importance of creativity and cultural entrepreneurship and for keeping the world's cultural heritage alive.